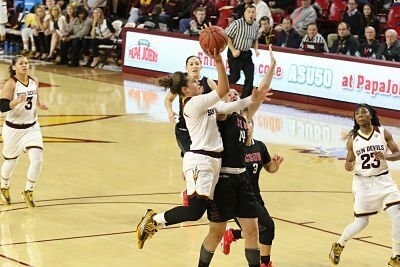 Arizona State guard Katie Hempen goes to the rack. The Sun Devils have been ranked in the top 25 all season long, and are in the top ten this week for the first time. Photo courtesy of Arizona State Athletics. If it seems that the Pac-12 Conference has ascended into the ranks of power this season, that’s because it’s true. 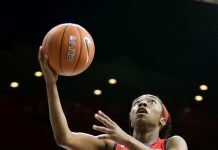 For the majority of the year the league has had five teams ranked in the top 25, with Oregon State and Stanford also hitting the top 10, as well as Arizona State for the first time ever this week. Cal dropped out of the rankings Monday, but Southern California jumped in for the first time since 2011. A Pac-12 spokeswoman said the last time as many conference teams were ranked was Nov. 13, 2006. Pac-12 coaches say the West Coast’s major Division I conference has been able to step up because every team has increased their strength of schedule, which is reflected in each program’s Rating Percentage Index (RPI). Going into this weekend’s games the Pac-12 has the NCAA’s top RPI, with five teams ranked in the top 15 and the last topping out at 144th. “To say this conference is great this year is not semantics and not politicking – it’s numerical fact, and numbers don’t lie,” said Cori Close, whose UCLA Bruins are ranked 17th this week. 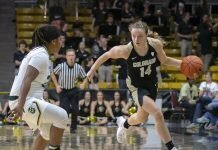 Things will not get any easier as conference play deepens, and teams are battling for position like never before. “We are playing each other the rest of the way, and we can’t make up any ground,” Washington coach Mike Neighbors said. It was Neighbors, now in his third year at the helm of the Husky program, who helped get the ball rolling for the conference in the spring of 2013. The self-proclaimed “stats guy” presented a report he’d compiled to Pac-12 coaches at the Final Four that year, which laid out a plan to raise the conference RPI. 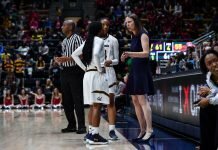 Teams began to schedule tougher competition and the results came quickly, as the Pac-12 put five teams in the NCAA Tournament in both 2014 and 2015 – the most since 2006. With such a strong RPI this year, that number could be even higher. Neighbors is hoping the NCAA Selection Committee sees it that way. But the road to the Big Dance is paved through playing one another, and Pac-12 coaches know that is a daunting task. Trojan coach Cynthia Cooper-Dyke is excited about the next month and a half. The Beavers, which coach Scott Rueck has grown into a burgeoning elite program in six short years, have faced losses and injury so far and are not necessarily a lock for a repeat title this year. But Rueck said he and his team love the battle. From 1984 to 1993, the formula was 20-40-40. In 1994, the weighting was “fine tuned” to the current 25-50-25 to de-emphasize factor three. One of the reasons for lessening factor three was because of all the factors in the formula, teams had the least control over factor three (opponents’ opponent winning percentage). Mathematicians evaluating the formula confirmed that too much weight for factor three gave weaker teams in strong conferences an inflated RPI, while strong teams in weaker leagues were penalized too much for having to play the teams in their league each year. Unlike some other formulas that create “preseason” ratings for each team, the RPI starts the season with every team exactly equal. That means an RPI cannot be compiled until all teams have played at least one contest. Only contests played against Division I teams are included in the compilation with the following two exceptions. Provisional Division I institutions in the second through seventh year of the provisional period or schools in the second through fifth year of reclassifying to Division I are included and ranked in the RPI. Provisional and reclassifying teams in year one of their transition period may petition the committee to be included in the RPI, provided their schedule meets Divisions I criteria. Institutions must apply for this RPI waiver by September 15 of the applicable year. Some have suggested the RPI ratings would be strengthened if it reflected margin of victory rather than just won-lost records. But point spreads would leave the program open to manipulation by coaches who desire to enhance their teams’ ranking by “running up the score.” Although scoring margins are not a factor in the RPI, they are a part of the materials provided the committee when the selection process is taking place. Anyone who has a calculator and access to the results of all Division I games can compile a team’s RPI by observing the following formula. (1) Factor I — Division I Winning Percentage: Take the team’s won-lost percentage against Division I opponents only. To Calculate: Team A was 23-8 in all games this season, but was 22-8 against Division I opponents. So Team A’s winning percentage is .7333. (2) Factor II — Opponent Strength of Schedule: Take each opponent’s won-lost percentage against other Division I teams (excluding the wins or losses against the team in question), then average these percentages. To Calculate: Add together the won-lost percentages (not the actual wins and losses) of all of Team A’s 30 Division I opponents (again excluding games against Team A and non-Division I opponents). For Team A’s opponents, the sum of their percentages was calculated at 16.1943. Now divide this total by 30 (the number of Team A’s Division I opponents) to determine the average. The average Division I winning percentage for team A’s 30 opponents (when not playing Team A) is .5398 or Factor II. (3) Factor III – Opponents’ Opponent Strength of Schedule: The strength of each opponent’s schedule is measured by computing the Factor II percentage for each opponent, then averaging these percentages. This recognizes the fact that two opponents with identical won-lost records may have played far different schedules. To Calculate: First figure the Factor II percentages for all of Team A’s 30 Division I opponents and add these 30 percentages together. For Team A’s opponents, the sum of these percentages was 17.0345. Now divide this total by 30 to determine the average. The opponent’s strength of schedule in Factor III is .5678. Once more sports committees began using the RPI, the NCAA Statistics staff, working with the NCAA IT staff, created the capability of “tweaking” the original RPI to allow bonus and penalty factors unique to that sport’s RPI. This option was introduced in 1994, the same year the weighting of the three factors was changed. Each committee was able to set specific mathematical values, based on wins, losses, ties or games played, as well as schedule strength. These values became Factor 4 and were calculated into the Original RPI and became the Adjusted RPI. The in-house RPI program allows the statistics staff to make virtually any type of mathematical change to the program for any specific sport and allows any committee to evaluate changes and the impact of those changes to both teams and leagues before any changes officially are implemented. Previous studies indicate that any tweaks to the Original RPI usually impact the “bubble teams” the most and permits the committee to more fairly separate teams that were bunched together in the Original RPI rankings.